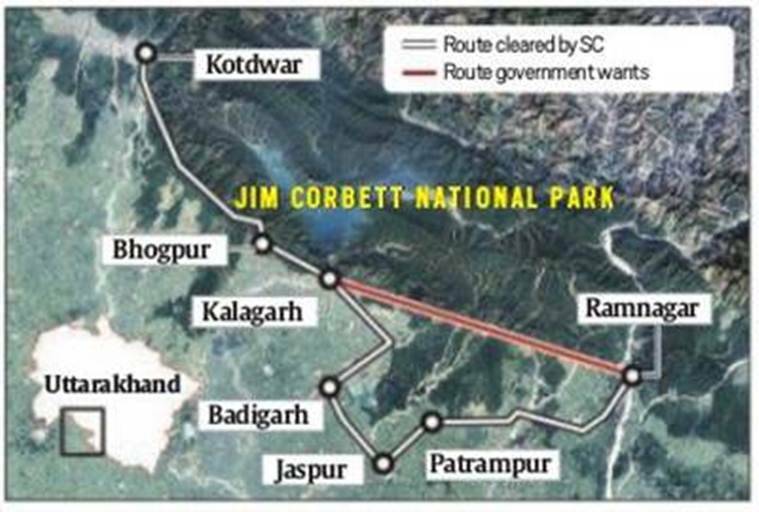 The state government is pushing this despite the fact that in 2005, the Centre and the states of Uttarakhand and Uttar Pradesh had agreed to an alternative route between Kotdwar and Ramnagar under the supervision of the Supreme Court (see map) to safeguard Corbett. This, when WII is part of National Board for Wildlife (NBWL) which decides on proposals seeking wildlife clearance and provides technical expertise to the Ministry’s Forest Advisory Committees that examine projects for forest clearance. Construction of this highway between Kotdwar and Ramnagar is on the priority list of the state government. A major part of this proposed highway runs through Corbett tiger reserve as a restricted and unpaved forest road. But if opened as a highway, it will cut travelling distance between Ramnagar in Kumaon and Kotdwar in Garhwal by 78 km but go right through one of India’s most rich elephant and tiger habitats. The state government is pushing this despite the fact that in 2005, the Centre and the states of Uttarakhand and Uttar Pradesh had agreed to an alternative route between Kotdwar and Ramnagar under the supervision of the Supreme Court (see map) to safeguard Corbett. However, work on that never took off. Contacted by The Indian Express, Siddhanta Das, director general (forests) and special secretary in the Environment ministry, said: “I cannot comment on specific clauses as I have not seen the MoU. The institute (WII) signs various MoUs as an autonomous body. But if there is a conflict of interest, the ministry will certainly look into it.” In the run-up to the 2017 Assembly polls, the state BJP threw its weight behind the demand for the route through Corbett. In his first press conference as chief minister in March 2017, Rawat listed the highway among his top priorities. The same month, state forest minister H S Rawat claimed he had written to and got assurance from Union Minister Nitin Gadkari that the proposed road would become a national highway. In December 2017, Ecotourism Corporation of Uttarakhand Ltd (EDCUL) was selected as the nodal agency for the highway project which would include construction of a flyover to allow wildlife movement inside the tiger reserve. Asked why this new study of a route already rejected by the apex court, Mathur claimed that “a lot has changed” since 2005. “Today’s reality is different. Balancing conservation and development is a dynamic process and science has also evolved. So a reassessment is not a violation, and facilitator is not a bad word,” he said. Jai Raj, Uttarakhand’s principal chief conservator of forests, said that the highway would be built as a “green road” as per the standard template prepared by WII. “We will follow WII’s guidelines that the Ministry already accepted last year. But the institute will not have to get any clearances. When the MoU says ‘facilitate’, it means that technical queries during the clearance process will be answered by WII,” he said. But experts questioned the WII’s agreement to facilitate green clearances. “As a Board member, I can go on record only when the project comes to the Board for approval. But, in principle, I consider this very wrong. A reputation for objectivity and neutrality is important for the WII,” said a non-government member of the NBWL on condition of anonymity. “It is unthinkable that a project that can kill Corbett will be reopened and that the WII will become a facilitator for getting clearances. Though autonomous, the institute comes under the ministry. So where are these decisions being taken? With what motive?” asked PK Sen, who, as then director, Project Tiger, conducted a field survey and recommended against the road project back in 2001.